A relatively new breed from Russia, the Peterbald is an elegant feline distinguished by its lack of fur. Its alien-like looks have been frequently attributed to but have not diminished its unique appeal. It is a wonderful addition to families as it is a very affectionate pet. First-time owners will also find this kitty a suitable companion at home. The Peterbald is said to have emerged only in 1993, after a Donskoy or Don Sphynx cat was crossed with an Oriental Shorthair. The resulting kittens were hairless, which were born in St Petersburg, Russia, were then named Peterbalds. As more people bred the Peterbald cats with the Donskoy, Siamese, and Oriental Shorthairs, a new feline bloodline arose. The new breed combined the qualities of its parent breeds—the baldness of the Don Sphynx and the elegance of the Oriental. As such, the Russian Selectional Feline Federation (SFF) acknowledged the Peterbald in 1995. The TICA followed suit in 1997. Then, in 2003, the World Cat Federation (WCF) also recognised the new breed. 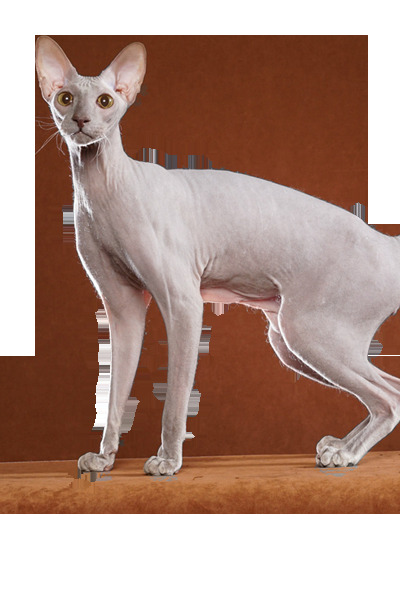 Today’s Peterbald cats have more Oriental traits than Donskoy. In later years, the brush-coated types were also recognised by TICA. The Russian Peterbald, on average, weighs 3-4.5 kg and has a very slim and graceful frame. Its head is narrow and long, which adds to its lean look. Its large, bat-like ears and almond-shape eyes are some of the traits it has gotten from its Oriental parent breed. Its muzzle is wedge-shaped, and its tail is whip-like. This kitty’s body may be lean but it is muscular, with agile oval paws. It is also distinctively “naked”—it lacks fur and thus has a hairless appearance. However, not all Peterbald kittens are fur-less. In fact, there are about 5 coat varieties of this cat. The ones with no hair, called ultra-bald, are born so and remain this way throughout its lifetime. There is the Flock or Chamois-coated ones, which only have 10% hair, mostly found on its extremities. Then there’s the velour variants (70% hairless), which still look bald from a certain distance. There also are the brush-coated ones and the straight coats. The brush-coated ones have fur that can reach 5mm in length. 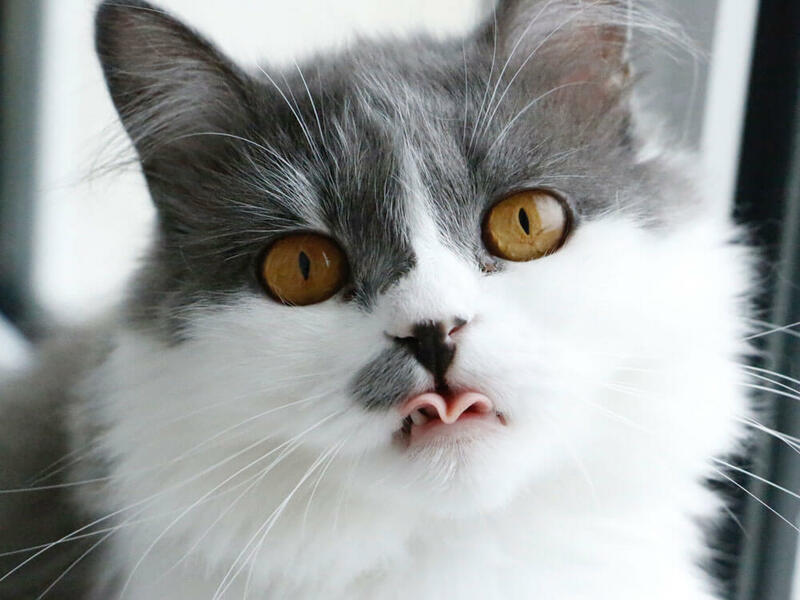 However, such cats may lose some of its hair as they mature. The straight coats tend to keep the same kind of coat throughout its life though. As for coat colours, it can be any of a wide variety of hues and patterns. Grooming involves weekly baths as this breed has no fur that can absorb its skin’s oils. This lack of hair also makes this cat attract dirt more easily than the average feline. The average body temperature of the Peterbald cat is higher (105 degrees Fahrenheit) than average (100 degrees Fahrenheit or a little below). The Peterbald is renowned for its dog-like affection and loyalty. It is said to be more than willing to follow your every step being an inquisitive feline. It is also energetic, albeit quiet. But when it is especially happy, it will purr its pleasure loudly. As a very social feline, it gets along well with children and other pets. As such, it is a suitable pet for families, as well as first-time cat owners. This kitty is intelligent and may learn to operate knobs on its own. As such, it needs to be sufficiently stimulated physically and mentally to keep it happy. The Peterbald cat should be provided a nutritious diet that fulfils its daily requirements. It should be consistently given the same food following the same feeding times. If there are changes to its diet, those must be done gradually to prevent digestive problems. The serving portions should depend on this breed’s weight, age, and activity level. It is known to have higher metabolism and may need to eat a bit more. Its meals must include at least 25% protein and just 5% carbohydrates. The Peterbald’s life expectancy has been estimated at about 12-15 years. Although this breed is a new one and thus is not as monitored as the other felines, it is a healthy cat. It is not yet established whether this feline has genetic issues. Despite being a healthy breed, it is sensitive to direct sunlight and changes in the weather due to its unique coat. Its skin must be coated with sunscreen to protect it from the sun’s rays. It should also not be exposed to cold weather without insulation. There are very few, if any at all, Peterbald breeders outside Russia. As such, such a well-bred feline is not easy to acquire outside its native country. The estimated Peterbald cat price is around £750 or more. This estimate does not include the costs incurred in neutering or caring for this cat. Is a Peterbald Right for You? This unusual-looking cat is a very affectionate and loyal pet that gets along with children and other pets. Its lack of fur requires weekly baths to keep it clean. It likes to follow its humans around. The Peterbald is a relatively healthy breed. Hereditary health issues are still undetermined. Its hairless body is sensitive to temperature and require sunscreen when going outdoors. This feline is suitable for first-time owners.